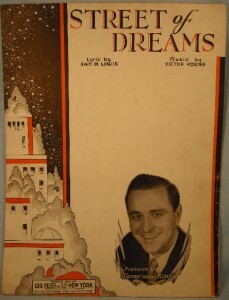 “Street of Dreams” has a classic depression-era sense, where love is one of the few things that may be impossible for those with money, but “no one is poor as long as love is sure.” Bing Crosby was the first singer to record “Street of Dreams”, though the Russ Columbo recording was also popular. Street of Dreams was recorded on October 28, 1959 and released in 1961 on the album Tony Sings For Two. It was arranged by Ralph Sharon. “Street of Dreams” was recorded on October 1, 1971 and released the following year on the album With Love. It was arranged by Robert Farnon.